FULL TIME; JAGUARES 25, STORMERS 14 - It's all over in Buenos Aires and it's the Jaguares who have broken their three-game losing streak against the Stormers. Starting fast and once again deadly on the counter from turnover ball, the Jaguares have made it difficult but ultimately, get the job done. 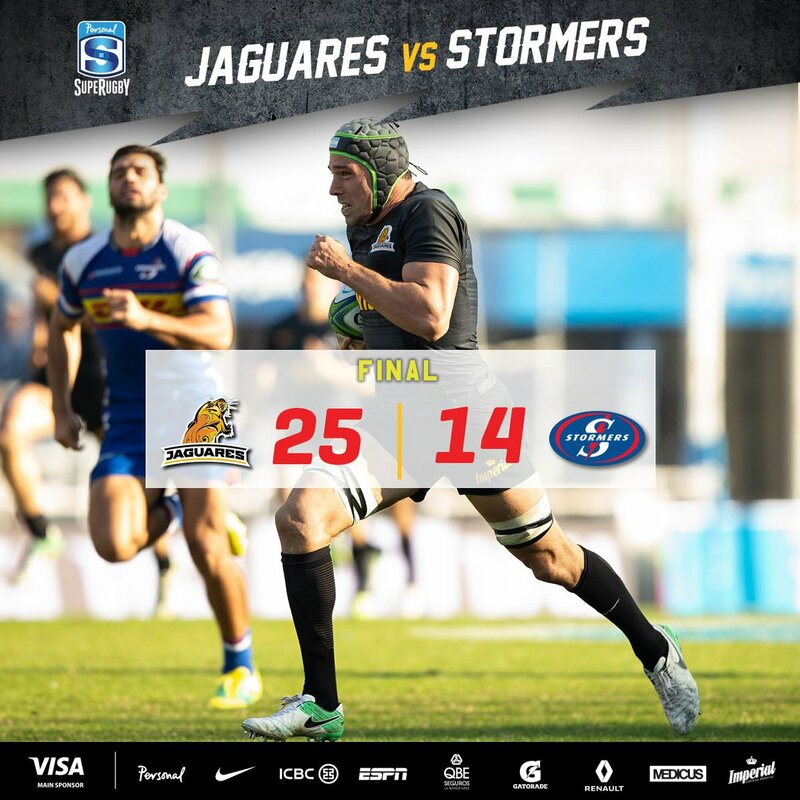 Despite a much improved second half showing from the Stormers, the Jaguares prevail by 11 points. That might just do it for the hosts as Notshe is brought to answer for being offside. From close range and with the posts in front, Sanchez buries the additional points on offer and extends the hosts lead to a tricky, but manageable, 11 points. PENALTY GOAL JAGUARES! (Nicholas Sanchez). JAGUARES 25, STORMERS 14. A spellbinding conversion attempt from du Plessis as he's once again hemmed in on the right sideline. Struck with plenty of curl, the ball is hooked over the black dot and bridges the gap to eight points. Jaguares need to be careful as the visitors have lifted. CONVERSION STORMERS! (Jean-Luc du Plessis). JAGUARES 22, STORMERS 14. Lovely play from Leyds as he shows all and sundry his superb footwork. Receiving on the outside of his man 10 metres out, Leyds swerves to the outside before managing to come back on the inside to bamboozle two defenders on his way to the chalk. Lovely footwork; mesmerising. TRY STORMERS! (Dillyn Leyds). JAGUARES 22, STORMERS 12. 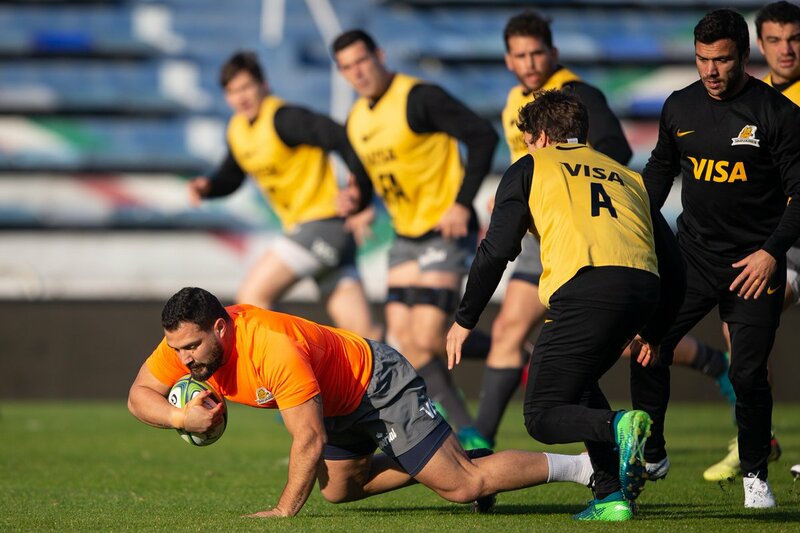 Against South African opposition, the Jaguares have actually won their last three home games. In that time, they've beaten th Sharks, Bulls and Lions with their last loss against a South African side a 31-30 loss to the Kings in July 2017. Interesting to note that the Stormers have not won away from home since July 15th 2017. That win coming in a high scoring 41-33 against the Bulls however since then, the visitors have dropped their last seven away games in a row. In seven out of their last 10 away fixtures, the Stormers have scored more than 22 points. Food for thought for the Jaguares as they seem stranded on 22 points at the moment. The Stormers more than capable of scoring points in quick bursts if the Jaguares aren't careful. It seems that Sanchez doesn't mind banging over the more difficult kicks as he lines up five metres inside the right sideline. Struck with precision once again, the ball is speared over the black dot and opens up a 15-point lead for the hosts. CONVERSION JAGUARES! (Nicolas Sanchez). JAGUARES 22, STORMERS 7. So deadly on the counter are the Jaguares as a turnover on their 30 metre line sees Petti hammering upfield on a 65 metre run. With the Stormers scrambling in defence, Sanchez slots in at playmaker and fires a perfect cut out to Orlando who dots down in the right corner untouched. TRY JAGUARES! (Matias Orlando). JAGUARES 20, STORMERS 7. HALF TIME; JAGUARES 15, STORMERS 7 - We're done for the first half in Buenos Aires and it's a deceiving scoreline which we're presented with at the break. Whilst this one appears to be tight, it's been the Jaguares who have dominated large portions of the contest however haven't put it on the scoreboard. At the interval, it's the hosts leading by eight points. The Jaguares are undefeated in their last six encounters when leading at Half Time. The hosts having not dropped a game when leading at the interval since losing to the Kings 31-30 in April 2017. A minimum of fuss with the first-up shot from du Plessis for the afternoon as he lines this one up 15 metres inside the left sideline. Taking only a small glimpse at the task ahead of him, du Plessis hooks this one with precision from 20 metres out. CONVERSION STORMERS! (Jean-Luc du Plessis). JAGUARES 15, STORMERS 7. The visitors are right back in this one as hard work up front sees them close to within 10 metres of the line. With Notshe receiving, he angles towards the left sideline, produces a beautiful shimmy and breaks the defensive line to dot down. TRY STORMERS! (Sikhumbuzo Notshe). JAGUARES 15, STORMERS 5. Sanchez's hot-and-cold day with the boot continues as he lines up pretty much right in front. With only 15 metres to travel, Sanchez somehow drags this one wide to the left. Sanchez jogs back non-plussed; should be at least a further six points up though. CONVERSION MISSED JAGUARES! (Nicolas Sanchez). JAGUARES 15, STORMERS 0. Scintillating attacking play from the hosts yet again as Sanchez releases a neat chip over the top. With Boffelli first to the drop, he smartly taps the ball back to the run of Petti who clears out at surprising pace to find the chalk from 35 metres out. Jaguares on fire. TRY JAGUARES! (Guido Petti). JAGUARES 15, STORMERS 0. Sanchez doesn't make an mistake with this one though as his attempt sees him pushed in tightly on the right sideline. With a minimum of fuss, Sanchez moves in and hooks this one straight over the black dot. Jaguares making an early run; Stormers in disarray. CONVERSION JAGUARES! (Nicolas Sanchez). JAGUARES 10, STORMERS 0. 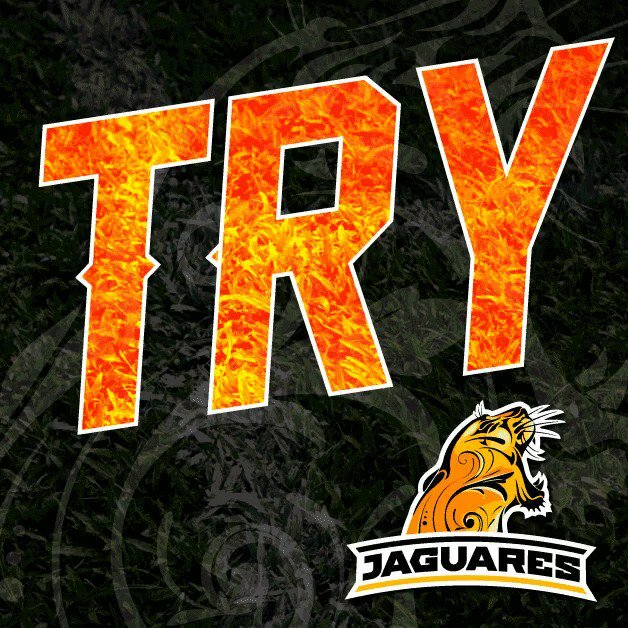 Fantastic move from the Jaguares as they shift the ball swiftly and quickly down their right side. With Delguy able to receive at pace from Bertranou, he fires downfield before cutting in off his right to beat a swag of defenders with a zig-zagging run from 45 metres out. TRY JAGUARES! (Bautista Delguy). JAGUARES 8, STORMERS 0. An unusual occurence for the Jaguares and indeed for Sanchez as Wiese is pinged for being offside. Stepping up to take another shot at three, Sanchez somehow shanks this one and leaves it to the left from 25 metres out. Hope it doesn't come back to haunt them. PENALTY GOAL MISSED JAGUARES! (Nicolas Sanchez). JAGUARES 3, STORMERS 0. The hosts start this one on the front foot as the Jaguares are awarded a penalty for de Allende being offside at the breakdown. Not one to turn down points, Sanchez duly steps up and bangs over the three points from 24 metres out. PENALTY GOAL JAGUARES! (Nicolas Sanchez). JAGUARES 3, STORMERS 0. 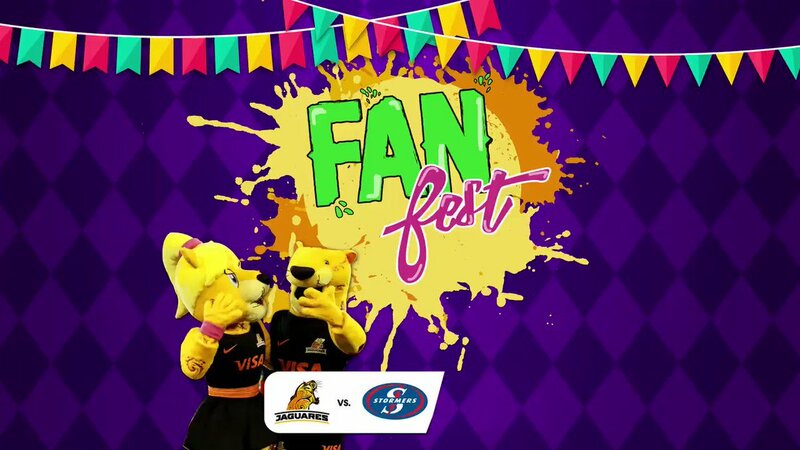 In the three times in which these teams have played each other, the Jaguares are yet to record a win against the Stormers. The hosts have been beaten by five, seven and eight in their fixtures against the South African heavyweights.. 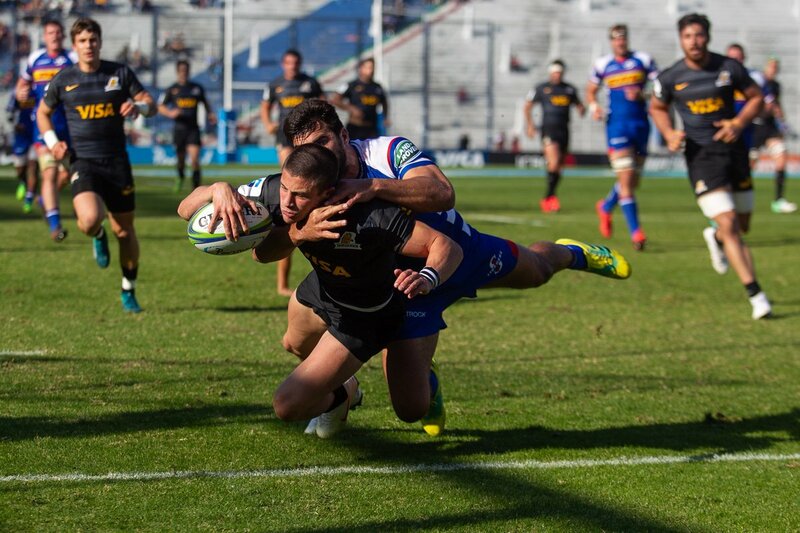 Welcome to Velez Sarsfield in Buenos Aires as Week 17 of Super Rugby continues with the Jaguares playing host to the Stormers..
¡Domingo en la oficina de Club Buenavista! Plantel completo en Club Buenavista para realizar la recuperación post partido. En el Club Buenavista, realizamos la recuperación muscular en la pileta. Two Hurricanes have been warned for a pair of incidents against the Brumbies last night. Repasá en fotos el triunfo de Jaguares frente a Stormers. "Jugamos un partido muy serio"
Hace su debut con Jaguares Diego Fortuny. Se retiró Agustín Creevy. Suma 3 más Nico Sánchez. Se retiró Santiago García Botta, e ingresó Javier Díaz. TRY de Stormers, el número 15, Leyds. Stormers tiene un penal a favor muy cerca del ingoal local. ¡A defender el line y maul! Matías Alemanno ingresó por Tomás Lavanini, en el primer cambio del equipo. Ataca Stormers desde su cancha, pero ahora Jaguares tendrá scrum a favor y posibilidad de ataque. En Vélez, Jaguares vence a Stormers al cabo de los primeros 40 minutos. En una de las últimas pelotas de la primera mitad, Jaguares ya está en campo rival. Bauti Delguy fue imparable y marcó el primer try de Jaguares. Ahora Jaguares busca retomar la posesión y comienza a proponer juego. Try de Stormers que achica distancias por intermedio de Notshe. Scrum para Stormers muy cerca del ingoal local. TRY TRY TRY de Guido Petti.